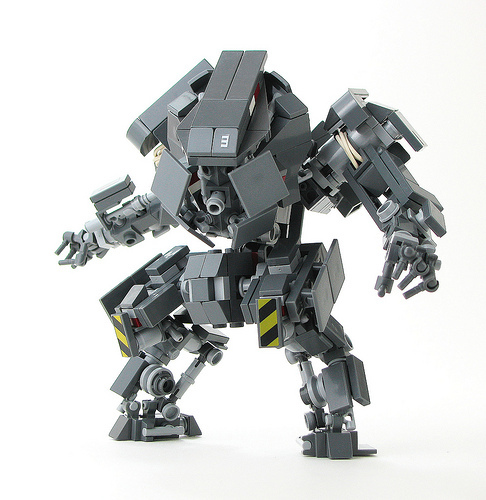 Brian Kescenovitz (aka mondayn00dle) is back at it, building more of the best Mecha around. This time he’s got this aggressive grey beast called the Weaver. It even fits a figure completely inside–which, come to think of it, may make it a large exo-suit. At what point does an exo-suit become a mech? Whatever you care to classify is as, though, there’s no question that it’s of the species awesome. Exo-suit: Augments the pilots movements through direct 1:1 control. Mech: Large robot driven by joystick or other abstracted control mechanism. Eg Steering wheel, joystick, thought helmet.